Unlike Worst-Case Scenario-style books that focus on the most wildly improbable circumstances, Buck Tilton's Outdoor Safety Handbook is the real thing: a clear-cut, no-nonsense handbook from a veteran outdoorsman and safety expert. What should you do if you encounter a bear in the wild? What if you fall through thin ice? Or run out of water? Or get sick on wild food? 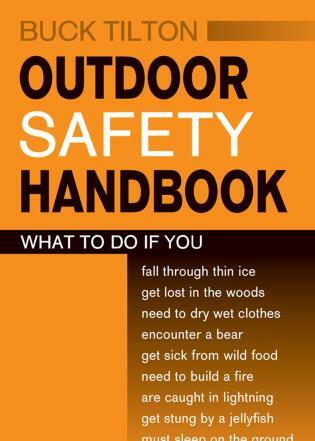 This handy guide provides no-nonsense information about what to do when something goes wrong in the outdoors--both emergency situations and annoying accidents--in a portable format that's easy to use in the field. Concise instruction explains exactly what to do when faced with outdoor trouble, with an emphasis on taking the best course of action right away. Buck Tilton is a co-founder of the National Outdoor Leadership School's Wilderness Medicine Institute and a winner of the Paul K. Petzoldt Award for Excellence in Wilderness Education. He has written numerous books on the outdoors and is a contributing editor for Backpacker magazine. Roberto Sabas is a freelance illustrator whose work has appeared in various publications. He lives in Savoy, Illinois.